With its successor around the corner and a six year anniversary just a few weeks away, we've shown some love for Wii this week. Despite its modest graphical power and SD output, it's outsold its rivals, made motion gaming a mainstream pastime and given us some terrific games. We've already looked back at six years of Wii and listed our top 20 games for the little white box, but now we want to get a bit more personal. Some of our staff decided to share their best memories of the system, mainly with a quirky vibe. Let's face it, with all of the Wii Remote swinging, waggling and pointing, alongside some of this generation's most creative games, all Wii gamers have a host of memories that make them laugh, cringe, or a bit of both. Below are some of ours. One of the most intriguing and ingenious character names with screenshots that promised at least a half decent game, Ninjabread Man was not just bad, it was awkwardly bad, awful in fact. The game is broken in almost every way; it proved extremely difficult to put into words for the review, an experience that can only be witnessed first hand (shudders). I've got some great multiplayer memories on Wii: making an idiot of myself playing WarioWare: Smooth Moves, flapping frantically at cardboard boxes in Let's Tap, the obligatory Christmas Day Wii Sports sessions. But one of my favourite experiences with Wii was fairly recent — the first time I played Beat the Beat: Rhythm Paradise — also known as Rhythm Heaven Fever — earlier this year. Over the course of a few hours my girlfriend and I passed a Wii Remote back and forth, giggling like idiots and battling back tears at the adventures of ridiculous pink birds, singing shrimp and bi-plane-flying cats. We repeated the event with friends, siblings and parents, each time to the exact same effect: grins all around and laughter rattling off the walls. It's just another example of that pure magic that only Nintendo can bring into the living room – and with Wii there were plenty of those little moments, whether it was in working out the timing of a particularly tough song in Beat the Beat, unravelling the joyous threads of Kirby's Epic Yarn or racing through the utter lunacy of Excitebots: Trick Racing. Tom Whitehead — That shot's impossible, right? 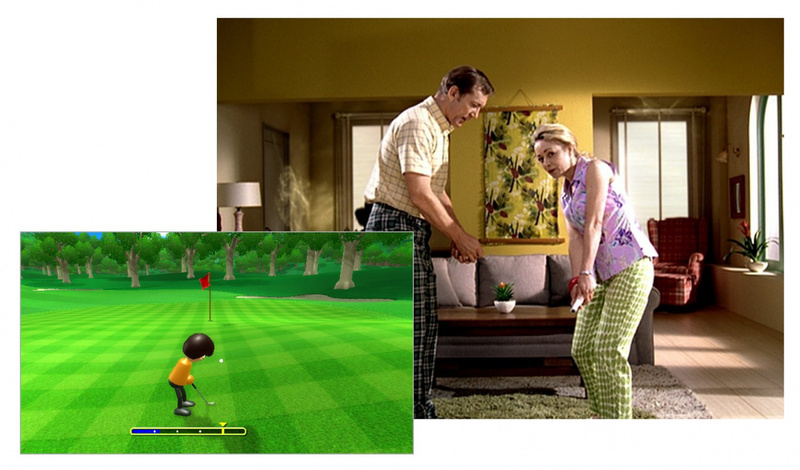 My main quirky memory, rather typically, is from playing Wii Sports; specifically from playing golf with my dad. In the early days (late 2007 in my case) we'd play every single weekend, to the point where it became a ritual. As the "gamer" I always wanted to win and played safe, while my dad took the role of the reckless, adventurous golfer. I was nicknamed Paddy, after the rather stoic Padraig Harrington, while my dad was Rory McIlroy, at the time a little-known but gifted young player who hadn't won anything, with a habit of trying over-ambitious shots. There's one hole in the original game, meanwhile, with a dogleg around some trees, though my dad was convinced that he could hit through them and get onto the green in one shot. I played the "experienced gamer" card and said there was no way he could get through; the game was programmed to make it impossible, I insisted. He kept trying, and trying, and then one day it worked. The ball sailed through the trees and landed on the green. We both started whooping and high-fiving, and the family dog, at that time a puppy, didn't have a scooby-doo what was going on. I'll keep it short, because this has happened to a lot of us. Playing Wii Sports for the first time on the day of buying my Wii, playing Tennis with my sister and as a result of me swinging the remote a little too violently, the poor girl had a black eye. She shouldn't have been that close to me anyway! My favourite quirky memory involving the Wii would probably the hours that my cousin and I spent playing Muscle March. I know that the game wasn't very well-received, and most people are terrified of the premise, but we absolutely loved the game. In fact, it's probably the game that we spent the most time playing together on my Wii. I know it sounds absurd, but we'd play until we laughed, and we'd laugh until we couldn't breathe. In my opinion, that's how you know when a game is reaching its players and helping to bring people closer together. It also has the best trailer, ever. Picture the scene. It’s Christmas 2006. I’ve bought a brand new Wii on launch day and have rarely stopped playing it since then, and we’re having the family round ahead of Christmas to exchange presents. Seems like a sensible time to bring the Wii into the living room for some Wii Sports fun right? Wrong. No sooner was the Christmas tree up and decorated, it was back down on the floor again, thanks to it being on the receiving end of an optimistic baseball swing. Add to that a few dents in the wall thanks to a lack of spatial awareness and I think it’s clear why the Wii never made it back to the living room! I definitely have wonderful memories of some of the 'classic' Wii moments — playing Wii Sports with my non-gaming friends, watching in terrified slow-motion as an errant Wii Remote flew towards our brand new HDTV and missed it by a millimeter, getting lost in extended jam sessions on Wii Music with my family - but for me the surprise stand-out of the console has been the stunning simplicity of its controller. As much as I love the WaveBird and the DualShock designs, there's something so gloriously uncomplicated about the sideways Wii Remote configuration. It was a perfect fit for the 'back to basics' approach to gameplay that defined some of the Wii's best games for me; Kirby's Epic Yarn and Return to Dreamland, Klonoa, Donkey Kong Country Returns and New Super Mario Bros. Wii proved that the era of two buttons and a D-pad didn't end with the NES. The Wii U may be bringing a bevy of new options with its GamePad, but I'm glad the Wii Remotes aren't going away just yet - they're a perfect embodiment of the blend of old and new that made the Wii so unique! 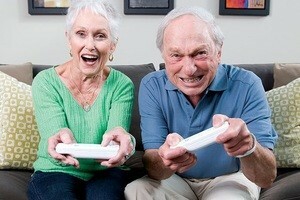 Back when the Wii came out it was ridiculously hard to get hold of. They were sold out everywhere, and when some did come into a store they were only small batches of units and most were to fill pre-orders, so very few hit the shelves. But you see, I had a dream, and I don't mean that metaphorically, I literally had a dream of going into a store and picking up a Wii console. It was an odd dream for sure; I could tell because it didn't fit the template for all my other dreams (steady on now! - ed). Anyway, I awoke from this strange dream and immediately called the same store I'd dreamt of, and low and behold they had just, and only just, received a batch of five Wiis. I asked them to keep one by for me, shot into town and picked it up. I lost my psychic powers after that, but I feel they were spent on a good thing. So those are some of our team's quirky memories of Wii. What about you? We'd love to hear about funny, embarrassing or strange Wii moments in the comments below. Muscle March is perhaps the best WiiWare purchase I made. What a great game. I just wish there was a sequel! Haha, that muscle march trailer is awesome! Yeah, my quirkiest moment was either mastering the weird step dance, or jogging on spot 30 minutes with Wii Fit Plus and trying to find the weird Mario Easter Eggs. Nope, I can't think of any. "I had a dream". Ah, I wish I could have a dream like that! But I had a dream once, similar to "the noodle dream" that the main character in kung fu panda ends up settling for after having a dream about kung fu (his father asks if he finally had "the noodle dream" and he ends up saying yes). I had the melon dream. So I went out and bought a lot of melons to eat. I like food dreams. Finding a Wii in a store back in Jan of 2007 was like hitting the lottery. They were still Sold Out everywhere at that time. However, I was out of work because of surgery (appendicitis) and just happened to be in a Walmart at 11am on a Tuesday and see a Wii on the shelf behind glass. Had it not been for the surgery I had, I never would have been in that store at that particular moment in time. I bought the Wii then went home and tried to play Wii Sports with a "still healing" incision in my belly. It was very painful, believe me. I had a Wii, finally....!! but couldn't properly play Wii Sports until weeks later. Probably the weirdest memory I have is with Animal Crossing CF. It was my first AC, and as I played it, both my bro and his girlfriend, who barely played anything on my Wii, made a character and spent hours playing it, every weekend. It was so extreme that the disc actually scratched and went unplayable. After that, they did not push to get a new disc, and tbh I felt relieved, as I was getting a bit tired of tending the flowers each and every day. Another one was lending my Rhythm Heaven Fever disc to a friend and then have him confess to me that his girlfriend was registering his discs in Club Nintendo and registered my Fever disc in his account! So that made him buy the game for himself, so he could replace my coins. And to be true, he loved the game anyway, so it was just a matter of time for him to get it. @Void Ya... I don't have any either. I remember to this day in 1986 when I received my first Nintendo. Though I had an Atari 2600, it was not until the NES that I was hooked on games. I say that to say this. The Wii was where I first introduced my kids to video games, and seeing them love to play is what I will bring out of the Wii experience. That and realize I was actually using an approach during Wii Sports Bowling. That Muscle March trailer was probably the greatest game trailer I've ever seen and probably ever will see. I agree with Morgan on the Wii Remote thing, only just realizing it somewhat recently while playing Final Fantasy on Virtual Console, it's like playing with a perfectly modern, wireless, compact NES controller. If there was any time I can recall being my greatest moment, maybe not quirky, was when I had a projector set-up to get the "big screen" Wii Sports experience, but my brother and I mainly used it to play Streets of Rage on while drinking beer. Good times. Quirky moments? No sorry, nothing to make you guys laugh or smile or anything... but I do laugh at people who destroy their house because they DONT WEAR THE FRICKIN WRISTSTRAP!!! THAT'S WHAT IT'S THERE FOR DUH! My mom scoring straight strikes on Wii Bowling on the day the machine was released and I brought it home. Scary! Back when I was just getting started I was playing Wii Sports baseball and went to swing the "bat" as hard as I could, only to smack myself in the knee (* insert bad meme here *). It really hurt but I just laughed like a fool. Otherwise nothing else but some crazy Smash Bros. moments and some weird conversations online playing MH3. Mother-in-law bowling in Wii Sports. The ball goes as slow as it can possibly go. 5 people are staring at the screen for 30 seconds waiting for the ball to reach the pins. She gets a strike. OMG WTF HAX! !1 That cow cheats somehow I swear. Playing Skyward Sword last winter with my friend. For some reason that night the remote sensitivity was very high, and we had chosen to get extremely drunk. Link was basically falling off the same platform over and over again and we weren't getting anywhere. We finally got to the next room, and there's a Skulltula in it. I started yelling, "Spider! Spider!" and trying to flip it and kill it. This sort of action is way too precise for a drunk person anyway, but with wonky controls, forget about it! I ended up flailing around until I about fell off the couch and then I yanked so hard all of a sudden the nunchuck pulled loose from the remote! Meanwhile my friend is laughing so hard tears are streaming down her face. After that we decided to play something else, haha! I miss those "Wii would like to play" commercials. Those were the best! Favorite moment with my wii was when I turned on the power button for the first time and witnessing my wii coming alive! I'll have to be unoriginal and say that playing Wii Sports with my family was definitely the best Wii experience for me! 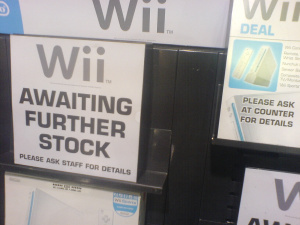 After refreshing the old "stock updates on various online stores" pages for a few months, eventually I caught a Wii available at Woolworths. Ordered on-line for store pick-up, and drove down to the store early one weekday morning before work (not entirely sure how I managed that given that the store was in Letchworth and I was working in London at the time). Anyway, it being just after the store opened, there was barely anybody about and I went to the collections desk to procure the Wii I'd ordered. They went to get it. And I waited. They came back, looking slightly confused and saying they couldn't find it. I gave them my number and they promised to look into it and call me. They did call me, saying they thought somebody must have swiped it, and refunded me. I was back on the stock alert pages that day. Eventually one came up at Amazon, which I ordered. Unfortunately the courier was HDNL, and they left no card to say they'd been and there was no evidence that they'd bothered trying to deliver anything. I forget how I found out, but I remember calling their depot trying to collect (as some people said they had done, despite HDNL not offering this "service"), and they insisted that I couldn't pick it up, even though it was easier for me and would have saved them some time too. I contacted Amazon who arranged re-delivery. On the day it was supposed to come (I'd booked an emergency day off) I got an email saying HDNL had now "found my parcel" (I didn't realise it had been lost) and would deliver it. Thankfully it did eventually turn up on the denoted day. I've never had such a traumatic experience trying to buy anything since. My mom bowling a perfect game in WiiSports. don't just start marching; start muscle marching! Brilliant trailer. One of the quirkiest moments was when my friend's kid hit the coffee table so hard bowling with wii sports that it took a chunk out of the wiimote. Good old spacial retardedness. Greg and i share the same story. Except i think gamestop got sick of a 13 year old kid calling every day to see if they had a wii in stock. one of my favorite memories was playing smash bros with my friend. It was around christmas my friend and i were playing smash bros. around 1:00am things started to get a litte goofy. we were laughing hysterically at every single thing we did, like wario jumping off his bike, attacks missing, characters facing the camera. we took a buch of pictures of every thing we did. and the next morning we looked at all the pictures we took and couldn't remember why we took it and why it was funny. we blamed the christmas tree and agreed that's what made us so dopy.